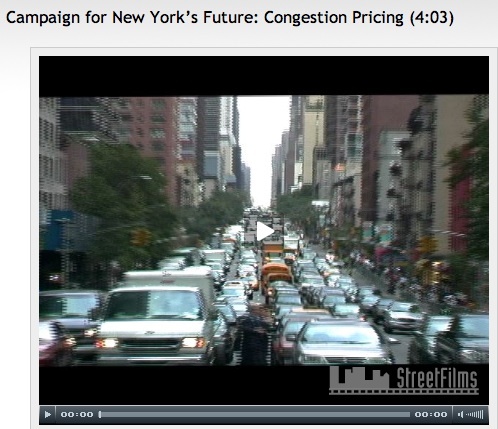 Browse: Home /	Congestion Pricing, Transportation, Urban Planning / NYC Needs Congestion Pricing! Don’t be fooled by the “tax on working people” rhetoric from politicians who speak for a small but vocal minority of their constituents; the vast majority of working people in New York City commute by public transportation. Those of us who do not drive in Manhattan during business hours are already paying a “tax” in the form of gridlocked streets, polluted air, and a potential subway fare hike, while automobiles and trucks use the streets for free. What the city desperately needs is dramatically improved bus service (Bus Rapid Transit! ), a real bicycle infrastructure (one you would feel comfortable sending your children or grandparents out on), expanded commuter rail service, and subway improvements to handle increasing ridership (with no fare hike). Congestion pricing is the only proposal on the table to fund these improvements; it has also been proven (most recently in London) to reduce motor vehicle congestion and air pollution while increasing transit and bicycle use.